Deck out your kitchen with 5 non-stick pots and pans to suit every cook up. 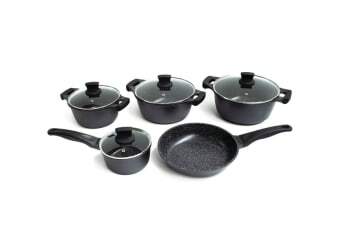 Whether you’re scrambling eggs or cooking up a lamb roast to feed a dinner party, the Westinghouse 5 Piece Non-Stick Pot and Pan Set has all your kitchen needs covered. Transform your cooking with little to no oil thanks to the non-stick properties of this set, enjoying healthier, less greasy tasting food. Say goodbye to long and arduous clean ups – the non-stick surface makes cleaning up a breeze!